A bold piece created and performed by CAN young Artists, What’s Done is Done took audiences deep into the darkness, then guided them back into the light at the end of the tunnel. CAN Young Artists took on Macbeth, with a debut production at HOME in March 2016. 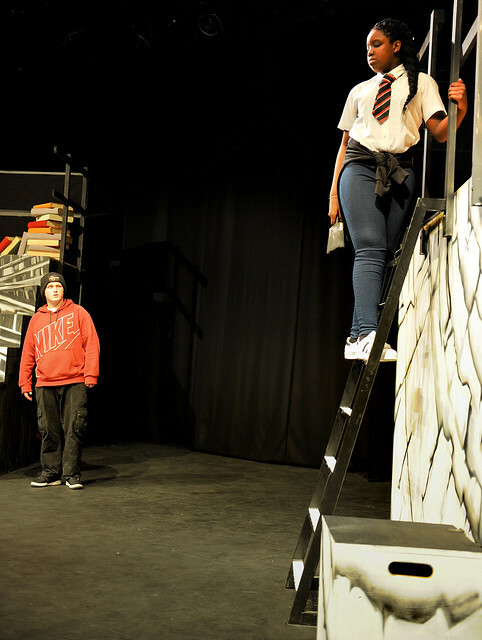 As part of the World Stages Festival in association with the Young Vic and Birmingham Repertory Theatre, Community Arts North West and HOME brought a brand new piece of theatre to the stage, created by a new young company aged 12-18, with members spanning seven Manchester neighbourhoods. Trish is sick of being the outsider, looking down from her window watching all her schoolmates having fun, she decides to do something about it. As events take a gruesome turn for the worst, she is forced on a harrowing journey through the hell of her own making. As she struggles to find normality she is helped and hindered by a loudmouth little brother, a demon drummer, a host of nightmare creatures and a mystic in fluffy slippers. The bold piece created and performed by CAN Young Artists, What’s Done Is Done took audiences deep into the darkness, then guided them back into the light at the end of the tunnel. What’s Done is Done was the first production of CAN’s 3 year Manchester based Young People’s programme. Supported by Children in Need, it aimed to provide quality cultural production opportunities, personal and creative development for young people aged 12 to 18 years from diverse communities including young people new to the region. HOME partnered up with CAN to produce a brand new piece of theatre with a group of talented young people from across Manchester. The project started back in September 2015 with outreach sessions which enabled CAN to build a young company aged 12-18 called CYA (Can Young Artists). The group took part in workshops every Thursday at Stun’s studio based at Z-Arts in Hulme before moving to HOME in 2016 to begin rehearsals for their performance. The piece of performance was inspired by one of Shakespeare’s greatest tragedies, Macbeth, and included movement, drama and live music. The project was in association with the Young Vic in London and Birmingham Repertory Theatre who have produced equivalent pieces of performance with young people inspired by the performance of Macbeth. The Manchester group went on a trip to London to visit the Young Vic group and watched their performance. They were all incredibly impressed by the work the young people in London had produced, and were inspired to get stuck into rehearsals for their own piece back in Manchester. • Take part in an intensely creative programme of workshops in Drama, Freestyle Movement and Dance, Spoken Word and Music, working with inspirational arts leaders. • Shape and perform an original and exciting contemporary theatre production in Manchester’s new iconic arts venue, HOME. • Make new friends and work as part of a close knit team. • Improve knowledge of theatre and careers in this industry. • Receive reduced price and free tickets for great theatre shows at HOME. • Gain a Bronze and Silver Arts Award. • 5 young people who are also interested in learning about how to shape and put on a production, have been able to join our ‘YOUNG PRODUCERS’ group to develop their production and leadership skills. • Visit the Young Vic Theatre in London and Birmingham Rep Theatre to see productions created by other young performers around the same themes.